2014 is the Year of Code - encouraging people across the country to get coding for the first time. Find out more about how we use github on our technology blog. The GDS design blog asks: how do people use related links? If you want to apply for the civil service fast track apprenticeship scheme you have until Wednesday 19th. The National Archives create a huge variety of podcasts - if you want something interesting to listen to this weekend you can find them here. We liked this post over on the Vehicle and Operator Services Agency blog about an unlikely cause for squeaky brakes. New funding has been allocated for new ways to encourage voter registration. We discovered Hemingway app to help us make our writing clearer. 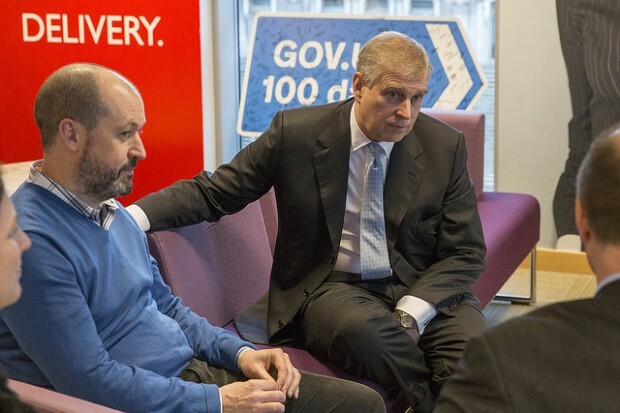 This week we had a visit from HRH The Duke Of York, who came to GDS to find out more about what we do. Among the topics discussed were apprentices, digital government, and getting SMEs involved with digital services. See more images from his visit here. What ARE you doing? Working on a weekend? Isn't there a law in the UK for a bureaucrat's timed work? A flogging at least. So we're doing compilations of links. I think it's great. Some of my previous correspondents, in innovation.gov.au, did it for while before the conservatives came in and shot the lot. Mind you, this is in a country where LGA's aren't recognized in the Constitution. So getting the local tails to wag their national dogs was never going to happen. Re: New ways to encourage voter registration. OK. So we've got as far as syncing mother (DWP) with her children (LGA's). And, so far as video demos are concerned, they've pointed to the back end rather than the front. So please, let's have a look at the front. Remember, "user"? I'm trying to get at what he's saying in the second video. 34 secs in. It seems like it's the security platform and the workflow that could be re-considered. (LGA) "web, to central gov app, and then back". Why? "In addition to these national organisations, additional funding is being allocated to local authorities across England, Scotland and Wales" A list of (the Local tails) please. The other projects seem like an awfully nice chap's idea of marketing. Even "Rock n' role" is just so sad. My 19-year-old nephew says "puke". PS. Don't knock the Rumanian self-oiling brake improvement system. It works like a gem (up to the point of impact).